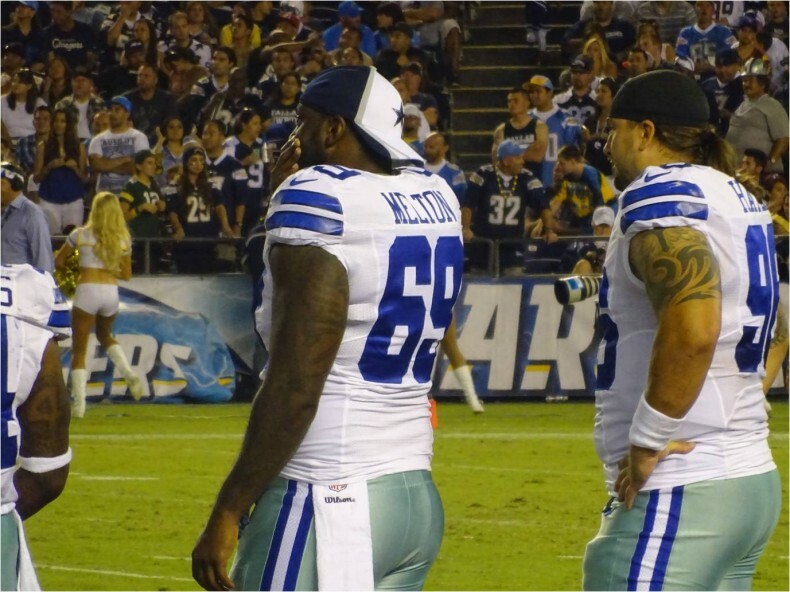 Back before the start of the 2013 season I wrote an article entitled “Dallas Cowboys Defensive Line Under Pressure” in which I discussed the bad feeling I had about the Cowboys projected defensive line starters. My gut told me back in August 2013 that then defensive coordinator Monte Kiffin’s scheme was not going to work with the defensive line personnel. Kiffin’s Tampa 2 defense is predicated on quarterback pressure. If there’s no QB pressure, the entire scheme breaks down. I have the exact same concerns about the defensive line now that I had last preseason. The projected Dallas Cowboys starting defensive line of LDE George Selvie, RDE Anthony Spencer, DT Nick Hayden, DT Henry Melton have a combined zero sacks and one quarterback hit. Now, neither Spencer nor Melton has played a single in-game down this preseason due to injury, so not fair to include their stats, right?! Fine, I’ll add both RDE Jeremy Mincey (Spencer’s preseason replacement for the most part), and DT rookie Davon Coleman’s (Melton’s replacement) stats into the mix and the numbers go up a whopping one tackle for loss and one quarterback hit both by Coleman against the Miami Dolphins. You as concerned as me yet? No, here’s some more sunshine for you; in three preseason games, the entire Dallas Cowboys defense has generated four sacks and seven quarterback hits. Remember, that includes garbage-time against third and fourth string opposing offensive lineman who might not even make an NFL team. By far the best game played this preseason by a Dallas D-lineman was defensive tackle Zach Minter when he registered two sacks, two tackles for loss, and one quarterback hit against the Baltimore Ravens, but he didn’t play against the Ravens starters. To recap, where the Cowboys stand today for their starting defensive line rotation is a defensive tackle coming off major knee surgery (Melton) and a DT who had no sacks last season (Hayden). At defensive end the Cowboys bring back Anthony Spencer who’s coming off a major knee injury (as of Tuesday it looks like Spencer won’t play in the season opener against the San Francisco 49ers), and journeyman George Selvie who may or may not be able to reproduce his career-high seven sacks from 2013. Does that starting lineup really thrill anyone? Who’s the proven, veteran “Rushman” as defensive coordinator Rod Marinelli refers to them? Who is going to get this team departed defensive tackle Jason Hatcher’s and defensive end DeMarcus Ware’s 2013 season’s lost 17 sacks? Is Spencer’s knee good to go? Is Melton ready to rumble on his busted wheel? Can Selvie double his production? Can Hayden get any sacks? From what I saw of Black, I agree. I’m just being honest here, the Cowboys starting defensive line rotation as it stands today doesn’t put fear in any opposing QB’s heart. In true final preseason game fashion, the Cowboys will likely hold out all of their starters. Cowboys Senior Vice President Stephen Jones said today that Henry Melton will play some against the Broncos, and I believe Cowboys fans would like to see many of the projected starters play as well. If the D-line play improves, it might help Cowboys Nation gain a better feeling about what the defensive line could be this season. If the Cowboys want to break the 8-8 streak, they need to get pressure on opposing quarterbacks, and stuff the run. Hopefully, the Cowboys can address the defensive line through perhaps a strategic acquisition or two, and prevent me from writing this story for the third time next preseason.